From single-coil to humbucking pickups the output varies, potentially causing a nightmare when it comes to dialing in your tone with multiple guitars through the same rig. If you’re using one guitar through a complex pedalboard, your signal strength can also suffer due to cable capacitance. 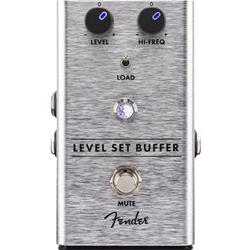 Enter the Level Set Buffer, a brilliant buffer pedal that lets you easily swap guitars without negatively affecting your tone. This original design features Level, Hi-Freq and Load controls to adjust the signal, along with a Main Mute footswitch for silent tuning. The tuner output lets your tuner be always on without interrupting your signal path.Designed by our in-house team of experts, the Level Set Buffer is an all-original circuit. We consulted with a plethora of players while designing this pedal, and the resulting stompbox is packed with stage-ready features. The chassis is crafted from lightweight, durable anodized aluminum, and the Amp Jewel LED gives your pedalboard the classic Fender look. The LED-backlit knobs show your control settings on a dark stage at a glance. We even made swapping batteries quicker and easier with our exclusive "patent applied for", magnetically latched 9V battery door.Making life better for guitarists everywhere, the Level Set Buffer is a truly universal pedal that should live on every pedalboard.